At this past Baselworld, Alpina declared that their focus for 2016 was “The Year of the Dive Watch.” The watchmaker has made diving history since the 1960s when the Seastrong “10” was capable of reach 200-meter depths. 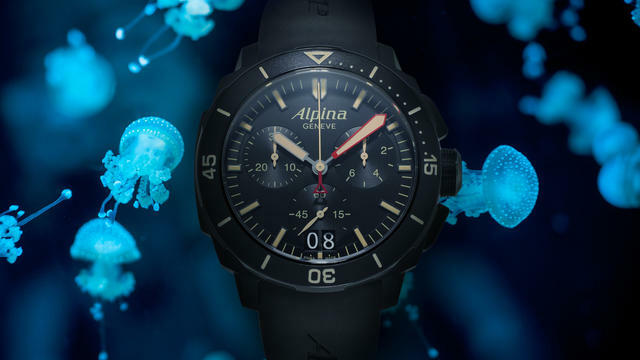 The Alpina Seastrong Diver 300 Black Chronograph Big Date is designed to cope with the most extreme conditions any professional diver could encounter. The watch has been designed with all the necessary features that allow owners to get the information they need, when they need it, for a safe dive. The aluminum, unidirectional, turning bezel turns in just one direction: anti-clockwise. With this fail-safe feature the number of elapsed minutes can never be accidentally decreased, only increased. The watch is powered by the AL-372 quartz chronograph movement. This high precision and extremely reliable 1/10th of a second. Swiss quartz chronograph movement features 30 minutes and 10 hours chronograph counters, add and split functions, big date and provides battery life of 48 months. An independent, family-owned fine watchmaking manufacture based in Geneva,Switzerland, Alpina was founded in 1883. For 132 years, Alpina has acted as a pioneer of theSwiss watchmaking industry with a multitude of innovations and patents. As the inventor of the modern sport watch, the brand continues its adventurous spirit through special initiatives incorporating both the professional explorer community and the adventurous watch enthusiast.